I've always liked Lawry's products. The boys are especially wild about the seasoning shake that's orange colored. They like that on almost anything. 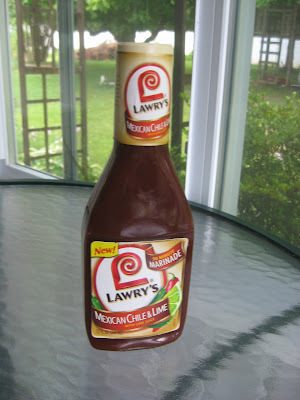 When I saw that Lawry's had grill marinades out, I decided I'd better get a bottle and see what they were doing with marinades. They had several different types of grill marinade, but I went with the Mexican Chile & Lime. I've always been a Mexican and Tex-Mex food fan. When I took the lid off, yum. This stuff smells fabulous. You get a combo of tomatoes, lime, and just a little chile heat. It's heavenly smelling. I was a little concerned about marinating in the Lawry's, since it's pretty thick. 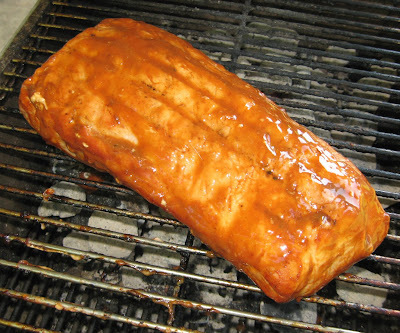 It must have more vinegar and less tomato and sugar though, because I didn't have any problems with burning, and I was grilling a pork loin (indirect heat on a Portable Kitchen grill). As the pork loin cooked, I continued to mop with the marinade. Hum. I'm not sure I'd do that next time. I'd say the 30 minutes and on smaller cuts of meat like boneless chicken breasts or maybe shrimp would work out better. With the time cooking and the mopping, the marinade ended up being a little overpowering. And, that's was just on the outside and is in the photo. Actually I liked the sauce. The boys weren't as keen on it. I think it's a good mixture and that this is just one where you want to use a light hand when marinating and probably avoid saucing other than for those who really like to do that. Just let them pour to taste as the flavors are strong on this marinade.